David Willey is not your ordinary science teacher. To put it mildly, he goes to extremes. Willey, an instructor of Physics at the University of Pittsburgh at Johnstown, walks across hot coals, sinks his hand in molten lead, strides across broken glass, and has concrete blocks smashed across his body while lying on a bed of nails. Each daring feat is a demonstration in science that Willey performs at venues ranging from college classrooms to NBC’s Tonight Show with Jay Leno . When I heard that Willey was scheduled to perform and lecture at the Center for Inquiry-International in Buffalo, New York, headquarters to the Committee for the Scientific Investigation of Claims of the Paranormal (CSICOP), and Skeptical Inquirer magazine, I was compelled to investigate. On a Saturday afternoon in mid-September, I drove in from Ithaca, New York, to meet and interview Willey just before he began preparations for the evening’s firewalk and demonstrations. When I met Willey, he was dressed in black jeans and boots, and a black button-down shirt. Trim and fit, he has jet black hair and a beard touched with gray, holds a charming British accent, and carries a quick wit and cleverness that belie his eccentricism. Born in England, Willey has an undergraduate degree in applied physics from Aston University, and a teaching certificate from Birmingham University. For a time he taught science at a grammar school in England before arriving in the United States in 1972 to earn his masters in physics at Ohio State University. As an instructor of physics, Willey has long believed in the appeal and usefulness of demonstrations in teaching. In the mid-1980’s, he started a traveling “Physics Show,” after his demonstrations proved to be a hit at a department open house. Today, he teaches classes at the university Monday through Wednesday, and travels Thursday and Friday to local high schools and grammar schools to perform. Willey’s demonstrations are not the cart and magnet exercises you might be used to from high school physics. As he described in his November 1999 Skeptical Inquirer article ”The Physics Behind Four Amazing Demonstrations,” Willey’s lessons in science border on the life-threatening. “I always have tried to include demonstrations. Nothing will grab a kid’s attention more than if a teacher is going to kill themselves. I have to use the demonstrations sparingly, just to get attention, and then slip some education into it,” Willey said. Willey’s interest in firewalking was sparked by an article written by Bernard J. Leikand and William J. McCarthy that appeared in the Fall 1985 issue of Skeptical Inquirer . The article proposed that firewalking is possible because of the low thermal capacity of the coals, and the short time of contact that a firewalker’s feet may have with the coals. The earliest known reference to firewalking dates to 1200 B.C., and belief in the supernatural nature of firewalking transcends religions, peoples, and geographic regions. 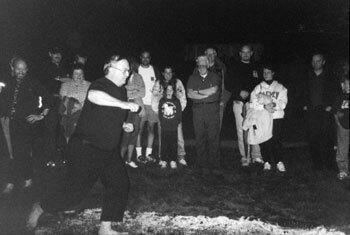 Even today, mystical superstition, popular fascination, and fear still cling to the notion of firewalking. In fact, when I told fellow graduate students at Cornell University that I was traveling back to Buffalo for the weekend to participate in a firewalk, students responded with admonitions that I was crazy. Others asked me if I were planning to prepare with several days of meditation before attempting the “death-defying” challenge. Although popular myth still surrounds firewalking, scientific explanations for the activity have existed for more than 60 years. In the 1930s, the University of London’s Council for Psychical Research organized two firewalks to study the phenomenon. In 1935, an Indian named Kuda Bux, and two British scientists walked across a 12 foot fire pit, containing mainly oak embers at about 800 degrees Fahrenheit. 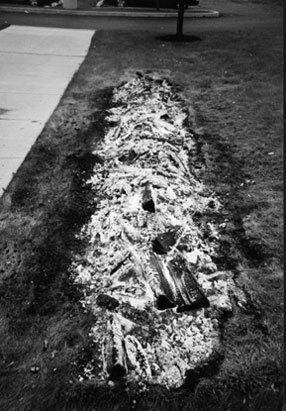 Then, in April of 1937, a Moslem man named Ahmed Hussain, Englishman Reginald Adcock, and several others took part in a second firewalk. With no pretense at supernatural power or assistance, none of the participants was injured or substantially burned. The Council for Psychical Research issued reports stating that religious faith and supernatural powers were unrelated to firewalking. Instead the Council concluded that the secret of the firewalk lies in the low thermal conductivity of the burning wood, and the relatively small amount of time that contact occurs between the hot coals and a participant’s feet. The prepared fire pit begins to burn down. However compelling these scientific explanations were to Willey, his interest in firewalking was not contained to his backyard. In fact, the physics teacher side of Willey led him to take up the public demonstration of firewalks, and the scientist in him brought his attention to the measurement of the heat transfer between foot and hot coal. 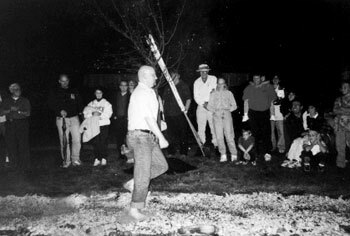 In 1997, near Redmond, Washington, Willey and a group of 23 people walked a 3.5 meter long fire bed and set a new world record for the “hottest fire intentionally walked on by a human being.” The most sizzling part of the fire, a blazing hot stretch that was approximately 0.5 meters long, ranged in temperature from 1,602 degrees to 1,813 degrees Fahrenheit. The previous world record had been 1,575 degrees, set in 1987. 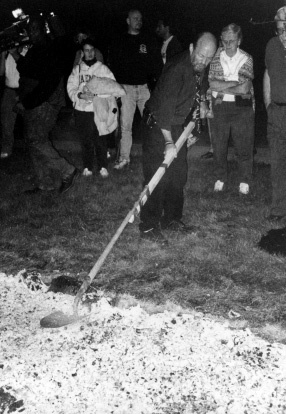 In 1998, Willey broke the record for the longest firewalk. Held on the campus of the University of Pittsburgh at Johnstown, he and 14 others strode across a 165 foot fire bed. No major injuries were reported. The previous world record for the longest firewalk had been set in 1987 at 120 feet. The Johnstown walk was also used to investigate the relationship between time of foot contact with the coals and temperature. Willey and colleagues gathered data on the length and temperature of each individual walk using infra-red and thermocouple pyrometers. According to Willey, the findings have yet to be reported. Willey prepares the fire pit at the Center for Inquiry as the crowd and local television news crews look-on. The firewalk at Johnstown gained international media attention, with cameras on hand from the BBC, the Associated Press, and the Discovery Channel. Among the firewalkers was ABC producer John Stossel, who at the time was working on a television special on the nature of belief. According to Willey, Stossel was a bit nervous at first, but eventually gained enough gumption to quickly walk across the coals. Skeptical Inquirer managing editor Ben Radford dares the wrath of the fire pit at the Center for Inquiry. In combination with the CSICOP team of Joe Nickell, Barry Karr, and Kevin Christopher, we unloaded a pile of ordinary fireplace logs from a truck at the front entrance of the Center for Inquiry. We laid a railroad line of the logs across the grass, at a width so that other logs could be laid perpendicularly across the bottom rungs. The logs were stacked in this railroad fashion till the pile of logs reached about three feet high. We were careful not to place the logs so that they were packed up against each other. The total length of the fire pit stretched a modest 10 to 12 yards. Newspaper was stuffed in-between the logs, the whole line of logs was drenched in gasoline, and the pile was set ablaze. After a few hours, the logs had burned down to coals, and the coals were raked out, bringing a hot red glow to the pit. Raking out the coals, according to Willey, leaves the impression that the fire pit is radiantly hot. “After the coals are raked out, it is then about 10 to 20 minutes before the pit is ready for walking, depending on how far down the coals have burned,” Willey told me. Skeptical Inquirer columnist Joe Nickell strides across the fire pit at the Center for Inquiry. So did this skeptic attempt the firewalk? Unfortunately, no. With full intentions, a prior engagement called me away before the pit was ready for walking. I look forward, however, to my chance in the future.